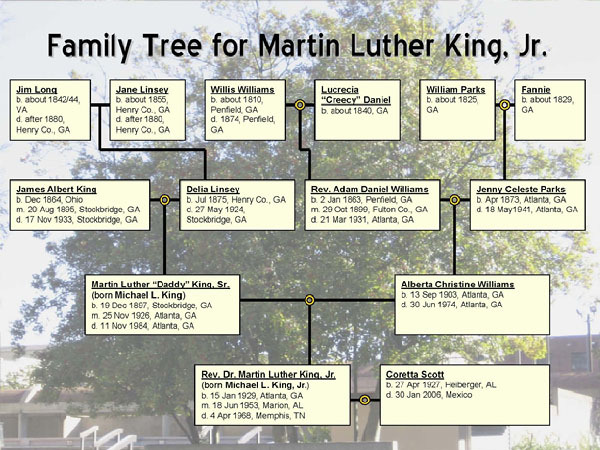 The Genealogy of Martin Luther King Jr.
Today, January 15, 2011 (edit: 2012, darn it!) would have been the 82nd birthday of Dr. Martin Luther King, Jr. He was born 15 January 1929 in Atlanta, Georgia. And those of us old enough to remember know only too well that he died 4 April 1968, on a motel balcony in Memphis, Tennessee, the victim of an assassin’s bullet. National Archives - Genealogy of Martin Luther King Jr. Uh, I think today is January 15, 2012, unless you wrote this post a year ago. I have GOT to get my 2012 calendar up already yet!!! Thanks, Annie! I’ll usually catch a mistake when it’s staring me in the face, but not this kind of mistake. The year change always catches me flatfooted instead.